Well, I’m finally back to perusing the best eateries that the Chicagoland area has to offer after a very long time away in Korea and around Asia. So first, I’d like to start off this post of Mastication Monologues with a quick snack that I sampled on the plane from London to Chicago. I managed to find a pretty good deal through the Irish air-carrier, Aer Lingus, so of course everything was Kelly green with shamrocks all over as soon as I stepped on the plane. Aside from that, it seemed like everything would be similar to a flight in the USA. 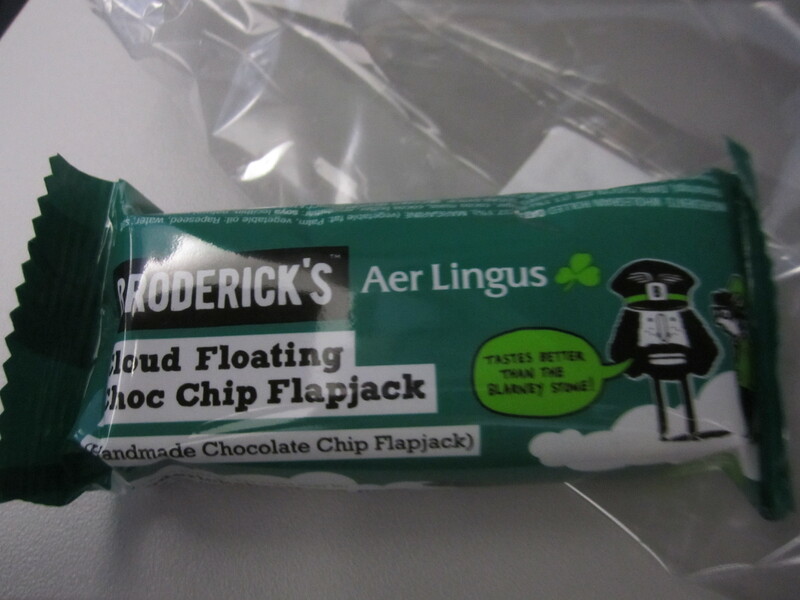 However, I knew that the food they served on the aircraft would reflect the national flavor of the airline, and they did not disappoint when they presented me with something that I’ve never seen before. The stewardesses were walking by with baskets offering us “flapjacks”, and I was greatly confused as to why they were walking around with pancakes in baskets? 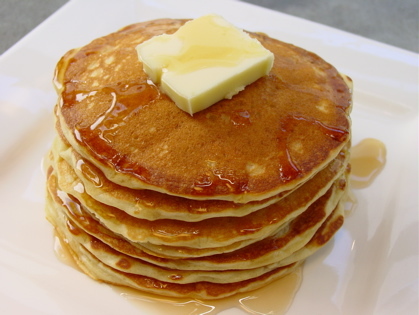 The reason being is that the word “flapjacks” in America is another way to say pancakes, so why would they be slinging these breakfast treats around without even giving people plates to eat them on? 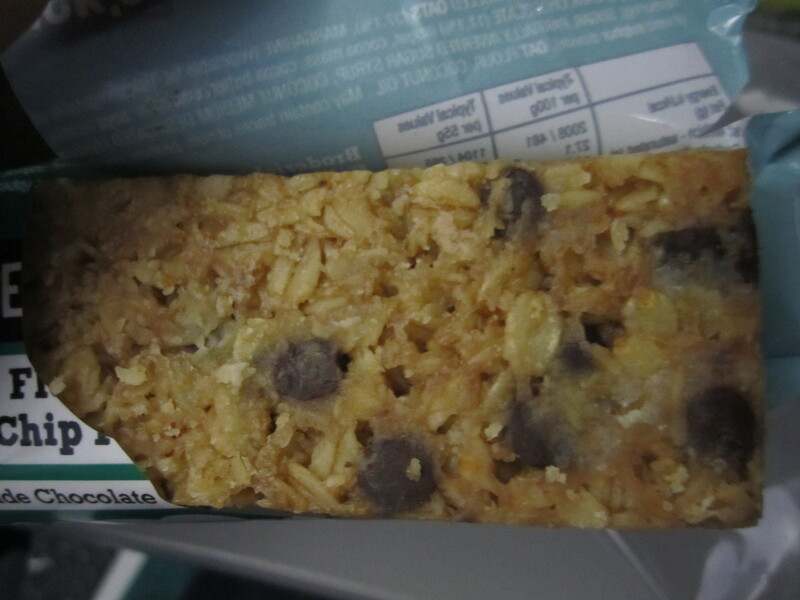 So, I said I’d take some flapjacks, and it ended up being this pre-packaged bar that seemed to be made of oats, sugar, honey, and chocolate chips. It tasted great and not as diabetes-inducingly sweet as you’d might think. It was like a more decadent granola bar. Moving on from cultural misunderstandings through English regionalisms, I’d like to call attention to a famous yet not so famous pizzeria in Chicago called Pequod’s Pizza. They have two locations: one in Morton Grove and one in Chicago. I went to the Chicago location on 2207 N. Clybourne Ave. Before I begin with my assessment of my dining experience, I’d like to first address a time-old polemic of pizza preferences: thin crust vs. deep dish. This has caused many a debate amongst friends in Chicago about who makes the best kind of each variety, and it has caused conflict between Chicagoans and other Americans (read: New Yorkers)/foreign tourists. I’ve found that many people from outside Chicagoland deride Chicago deep dish pizza for not even being pizza and more like some sort of mutant casserole, cake, pie, food brick, etc. Instead, they prefer the wafer-thin New York City slices that are more similar to pizza from Italy. I won’t get into a pizza debate while writing this post, but I’d like to hear what kind of pizza do you prefer? Personally, I like it all, but I will always defend deep-dish pizza as being a fantastic version of pizza. As for those who say it’s not pizza, it still has all of the main components of pizza: crust, cheese, and tomato sauce but just on a more grandiose scale. An analogy I always use for the naysayers involves a pickup truck vs. a monster truck. Both have the same components of a truck: four wheels, general body shape, an engine, and a steering wheel. The main difference is the monster truck can do sweet jumps, crush cars, and has enormous wheels, but you cannot deny that it still is a truck despite the difference in appearance. Anyway, back to Pequod’s. I had heard many good things about Pequod’s through various forms of media and word of mouth, so I decided to make reservations there ahead of time for Friday dinner. I highly recommend you make reservations on the weekend as I arrived to a thirty minute wait even though I called in for a table beforehand. Thankfully, they were very prompt with their service, and my friends and I were seated at a nice corner booth. 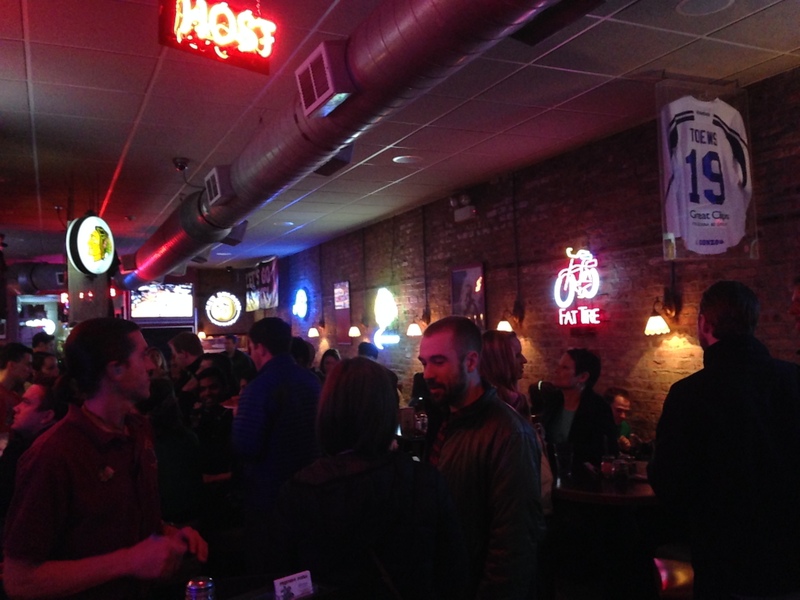 The overall ambiance is just a general bar and pizzeria with two floors of tables and booths. 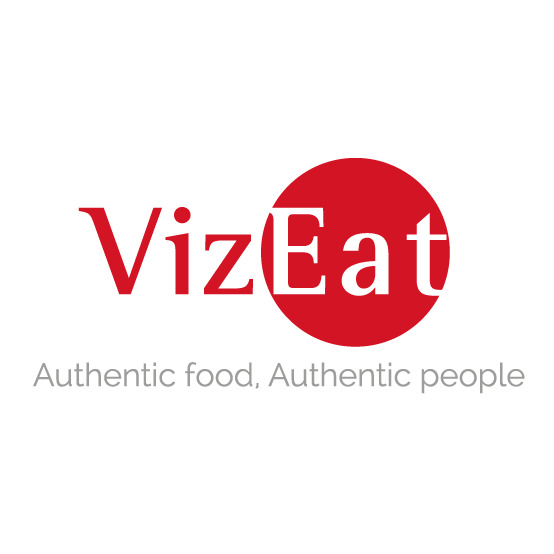 Their menu was manageable with basic bar food along with their famous pizza that sports a “carmelized crust” that seemed to be enhanced by the type of pan they used to bake them. The only appetizer we got was cheesy garlic bread that was passable, but nothing that really wow-ed me. Thankfully it wasn’t as greasy as the garlic bread I got in London at Bunga Bunga. I didn’t like that they charged us for an extra cup of marinara sauce on the side when neither of the cups were adequate for four hungry people. 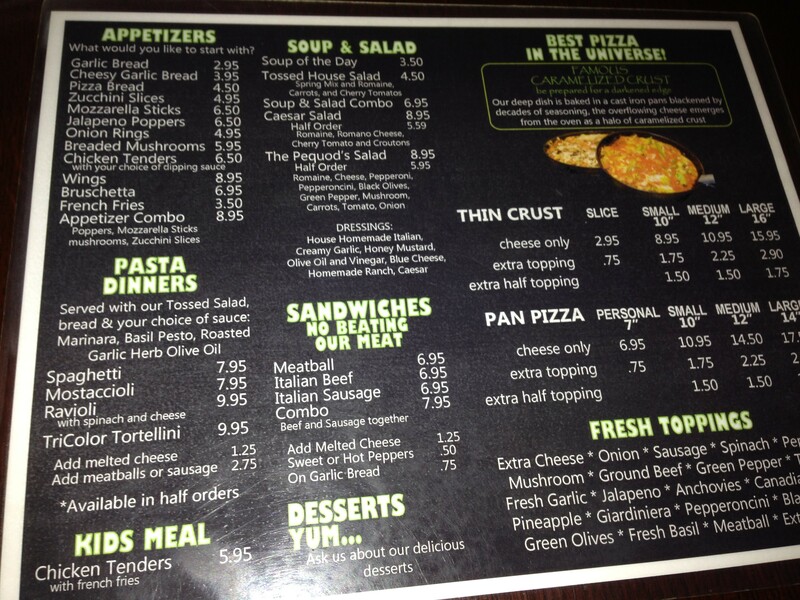 It was a minor setback as we segued to ordering a large pan pizza (17.50) with cheese, spinach, pepperoni, and sausage. Like all pan pizzas, it took around 45-50 minutes to cook since there is a lot more to heat up compared to the thin pizzas found anywhere else in the world. When it came out though I was very excited since it looked to die for. Best welcome back meal ever. 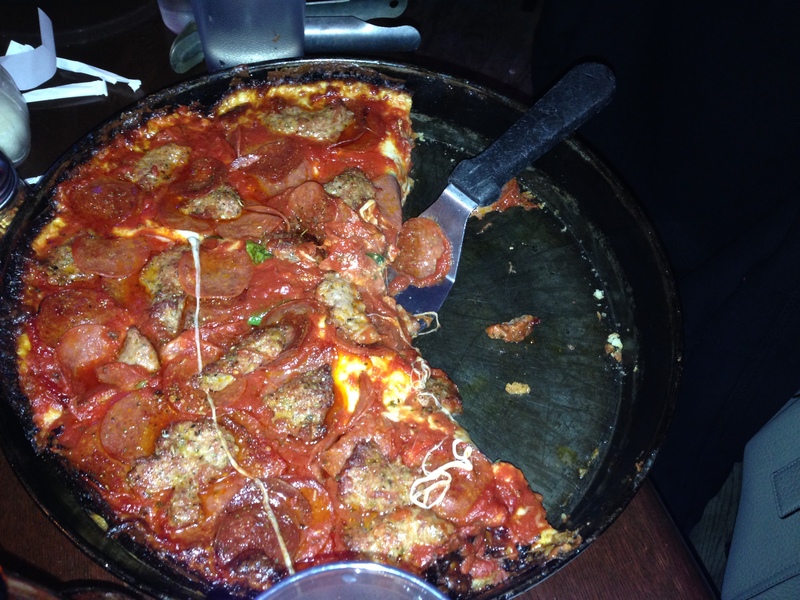 Upon taking my first bite of the pizza, I knew I was won over by Pequod’s pizza. The crust wasn’t extremely thick but still substantial enough to support the avalanche of delectable toppings piled atop it. With each bite, there was plenty of gooey cheese, seasoned pieces of Italian sausage, non-greasy pieces of pepperoni, and semi-chopped pieces of spinach which I really enjoyed in comparison to Giordano’s finely chopped spinach they use in their deep dish pizza. As I reached the end of my first piece, I encountered the caramelized crust they boasted about on the menu. Even though caramelization essentially means the food is burnt like the sugar on top of a creme brulee, I did not get burned by this flavorful and crunchy crust. I couldn’t quite put my finger on it, but it tasted like some well done cheese on the edge of the crust along with the very slightest hint of sweetness to balance the overwhelming wave of savory ingredients that had just washed over my palate. I tapped out at three pieces which is the equivalent of probably eating ten pizzas at Grimaldi’s in Brooklyn, but my friends and I left very satisfied customers. 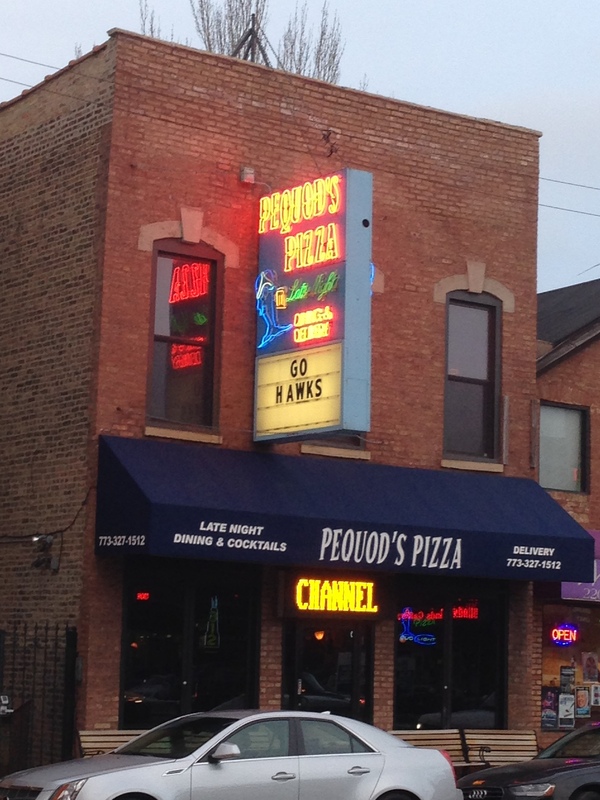 So, if you want to check out a popular Chicago pizzeria that isn’t as big as Uno’s or Lou Malnati’s but still has delicious pizza at reasonable prices, check out Pequod’s pizza. I finally found and enjoyed my white whale. Here’s my updated pizza list in Chicago: 1. Giordano’s, 2. 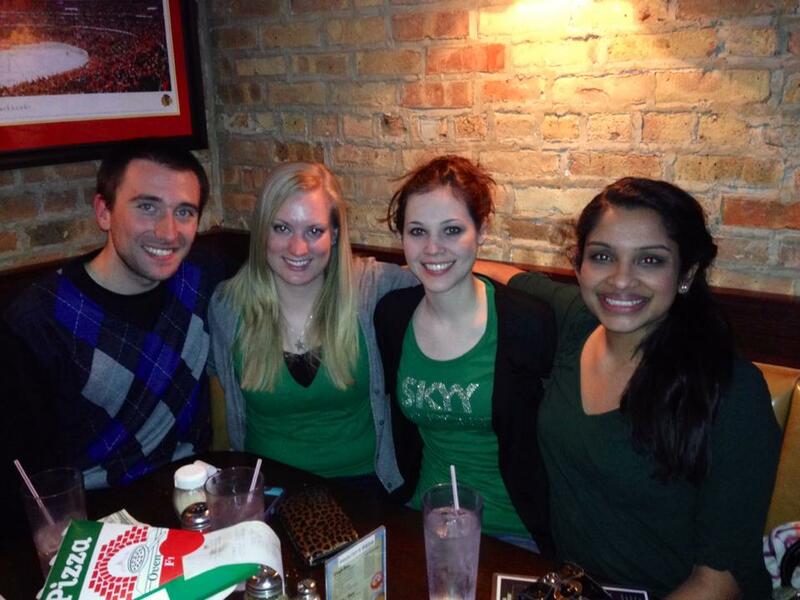 Lou Malnati’s, 3. Pequod’s, 4. Uno’s, 5. Apart. What’s your favorite?